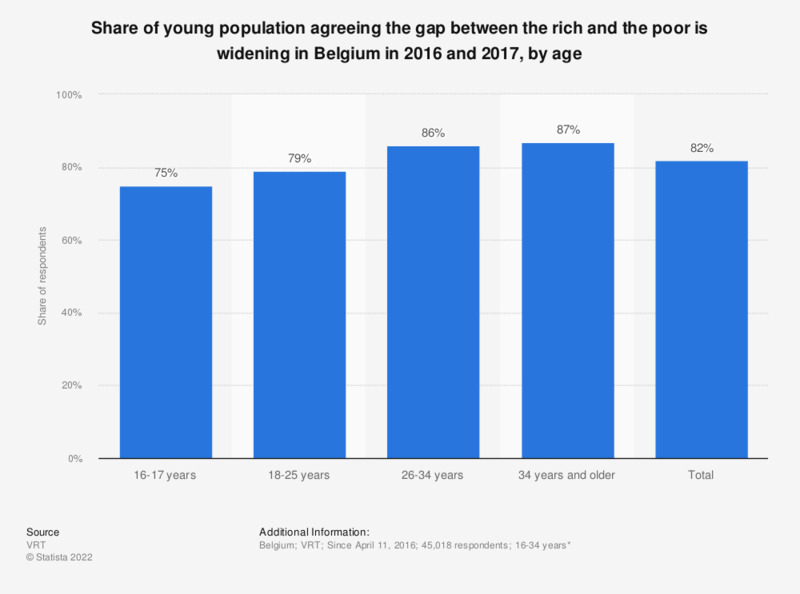 The statistic displayed above shows the share of the young population agreeing with the statement that the gap between the rich and the poor is widening in Belgium in 2016 and 2017, by age. 75 percent of the Belgian respondents aged between 16 and 17 years old believed the wealth gap in Belgium is growing. * n (16-17) = 2,759, n (18-25) = 22,172, n (26-34) = 16,886, n (34+) = 3,201. Although the survey is specifically focused on the generation aged between 16 and 34 years, people older than 34 were also able to answer the survey questions, hence the category 34 years and older. The statistic displayed above represents the share of the respondents that agreed with the statement. In which areas do you think young people today are penalized in comparison with the previous generation? Do you think that in Italy the intergenerational inequality is accentuated?